Chronic caloric restriction consists of eating a reduced but balanced diet from early adult life onward. Previous research, into macaques in particular (which have an average lifespan of forty years), had already demonstrated its beneficial effect on the incidence of age-related pathologies. However, its positive effect on the lifespan of primates remained controversial. To study this question, the researchers focused on the grey mouse lemur, a small primate whose lifespan (around 12 years) makes it a very good model for the study of aging. Moreover, this small lemurid has many physiological similarities with humans. 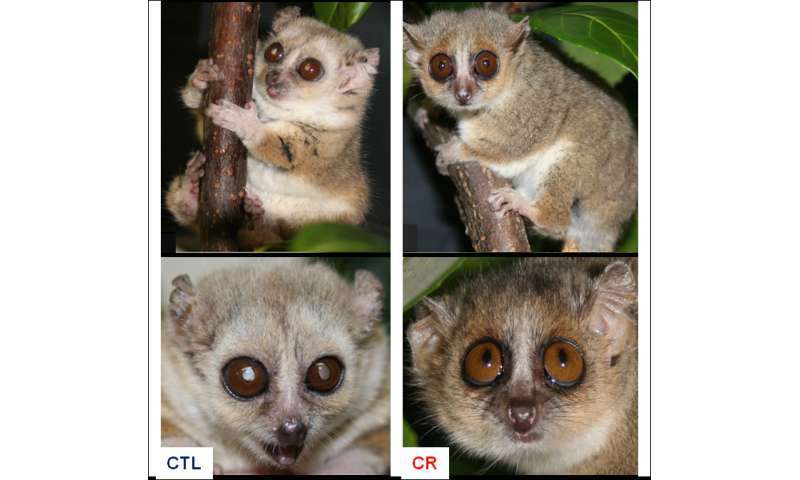 The scientists exposed a group of mouse lemurs to moderate chronic caloric restriction (30 percent fewer calories than their peers consuming a normal diet) from the outset of early adulthood (Restrikal cohort, see visuals below). They then considered their survival data as well as possible age-related alterations. The first result, after the experiment had been running for ten years, was that in comparison to the animals in the control group, the lifespan of those subject to caloric restriction increased by almost 50 percent. More specifically, their median survival is 9.6 years (compared to 6.4 years for the mouse lemurs in the control group). And for the first time among primates, the scientists observed that the maximum lifespan had increased—almost a third of the calorie-restricted animals were still alive when the last animal in the control group died at the aged of 11.3 years.